I love trying new things and especially new beauty products. The list below are some of my favourite beauty staples that are affordable. 1.Philosophy Face Cleanser Purity- I love this face wash! It's gentle enough for the eye area yet strong enough to remove make-up. This product is perfect for the person who loves to do 3 things in 1 step; remove make-up, tone and moisturize. You can get it at Sephora or if you are Canadian Shoppers now carries Philosophy in their beauty boutique. 2. Hashmi Kajal- I have tried so many eyeliners from Quo to Makeup Forever to Benefit. It is so hard to find the perfect one! But at the end I always come back to my Hashmi Kajal stick. It's cheap and lasts long without smudging and is made from all natural ingredients. It only costs $2.50, so it's definitly worth a try. You can buy it at any Indian or Arab grocery store they usually have it near the check out counter. 3. Tarte Coloured Clay CC Undereye Corrector- Concealer is the one product I never leave the house without slathering it on like war paint! I have tried so many to find the perfect one and for the moment this is it. This is the one product I feel confident leaving the house in, that I know fully covers my dark under eye circles. 4. Bioderma Photoderm Max Cream SPF 50+- Wrinkle make me super paranoid so I started using sunscreen on my face everyday. This formula is light coverage and doesn't leave your skin feeling oily. I used it back to back for 2 weeks and no break outs! Amah-zing! 5. Make Up For Ever HD Blush - Blush is essential if you don't want to look like a ghost in the morning. This creamy formula is just the right amount of coverage and really helps to highlight the cheekbones. You can apply this with a brush or your finger tips, which is great if you are running late. 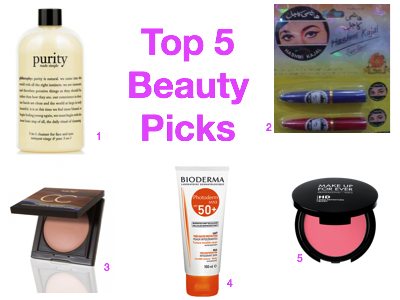 What are your beauty picks? Is there anything you think I should try?